Recognizing the recent Catechetical revision which declared the death penalty “inadmissible” in all cases, engaging in this conversation around capital punishment is truly more important than ever -- and people of faith are up to the task. CMN would like to introduce you to some of these grassroots activists who are champions for life and human dignity in the Church. We couldn’t do this work without them. We'll start off in Washington, where last year’s repeal efforts laid a robust groundwork for the upcoming 2018 lgislative session. Here, longtime death penalty abolitionist Sr. Joan Campbell connects Catholics with local and national anti-death penalty groups and provides opportunities for their prayerful engagement. "Being a pen pal to an inmate is one way to respond to the Gospel mandate, 'I was in Prison and you visited Me,'" Sr. Joan says. She also recommends getting involved in your state's abolition movement, local restorative justice groups, and of course, lots of prayer. In Louisiana, another state on the cusp of repeal, Fr. Keith Labove is working this October to ensure his parishioners understand the ins and outs of the Catechetical revision. Pastor of St. Patrick’s Catholic Church in the Diocese of Lafayette, Fr. Keith maintains a firm belief that our brothers and sisters on death row should be included in the conversation when it comes to respecting human life. "I have long believed that ‘Respect Life’ simply has to mean ‘respect for every life,’” Fr. Keith says. “The devil is in the exceptions. If we can make an exception over a criminal act, or the color of one’s skin, or one’s country of origin, or the fact of being sick or elderly, thus allowing unnecessary killing, then why can’t someone else make an exception regarding the unborn child?" "There is an increased interest in learning more about the Church’s teaching on [capital punishment]," Visosky says. 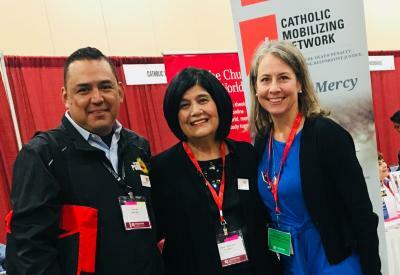 "Our diocese and local Catholic university are co-hosting an annual ministry conference for educators (teachers, catechists, etc) to which we were invited to provide teaching in English and Spanish on this issue in light of the change to the Catechism. Our ministry is also planning an evening of dialogue on the topic that we hope will help our community to learn more, ask questions, and engage." CMN's work to end the death penalty depends on the prayerful engagement of Catholics throughout the U.S. This network of activists ensures that our Church upholds its unequivocally pro-life stance -- both in creed and practice.